Destitute peapickers in California; a 32 year old mother of seven children. February 1936. 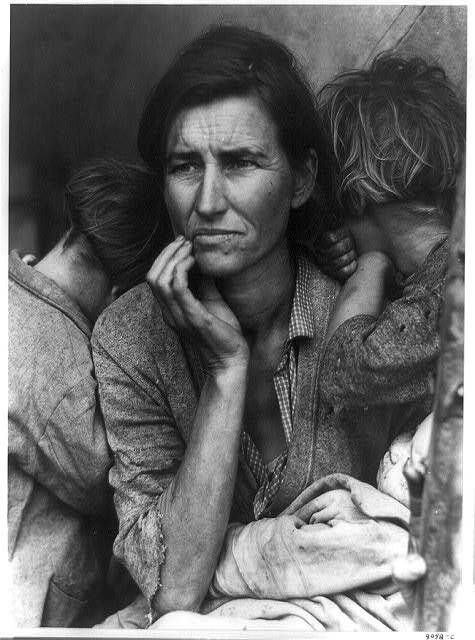 Dorothea Lange. Bateson, Gregory and Margaret Mead (1942). Balinese character, a photographic analysis. New York,: The New York academy of sciences. Doty, C. Stewart, Dale S. Mudge, et al. (2002). Photographing Navajos : John Collier, Jr. on the reservation, 1948-1953 by C. Stewart Doty, Dale Sperry Mudge, Herbert J. Benally ; photographs by John Collier Jr. Albuquerque: University of New Mexico Press. Kratz, Corinne Ann (2002). The ones that are wanted : communication and the politics of representation in a photographic exhibition. Berkeley: University of California Press. Parr, Martin and Simon Winchester (1995). Small world: a global photographic project, 1987-1994. Stockport England: Dewi Lewis Pub. Poole, Deborah (1997). Vision, race, and modernity : a visual economy of the Andean image world. Princeton, N.J.: Princeton University Press. Smith, W. Eugene and Aileen Mioko Smith (1975). Minamata. New York: Holt Rinehart and Winston. Vogt, Evon Zartman (1974). Aerial photography in anthropological field research. Cambridge, Mass. : Harvard University Press. Westermarck, Edward and Kirsti Suolinna (2000). Portraying Morocco : Edward Westermarck's fieldwork and photographs 1898-1913. ?Abo: ?Abo Akademis F?orlag. Banta, Melissa, Curtis M. Hinsley, et al. (1986). From site to sight: anthropology, photography, and the power of imagery : a photographic exhibition from the collections of the Peabody Museum of Archaeology and Ethnology and the Department of Anthropology, Harvard University. Cambridge, Mass. : Peabody Museum Press : Distributed by Harvard University Press. Devereaux, Leslie and Roger Hillman (1995). Fields of vision : essays in film studies, visual anthropology, and photography. Berkeley: University of California Press. Edwards, Elizabeth (2001). Raw histories: photographs, anthropology and museums. Oxford ; New York: Berg. Fitzhugh, William W. and Chisato O. Dubreuil, Ed. (2000). Ainu : Spirit of a Northern People. Seattle: University of Washington Press. Howarth, Anthony (1967). Kenyatta, a photographic biography. Nairobi: East African Pub. House. Pezzati, Alessandro and University of Pennsylvania. Museum of Archaeology and Anthropology. (2002). Adventures in photography : expeditions of the University of Pennsylvania Museum of Archaeology and Anthropology. Philadelphia: University of Pennsylvania Museum of Archaeology and Anthropology. Phillips, Sandra S., Mark Haworth-Booth, et al. (1997). Police pictures: the photograph as evidence. San Francisco: San Francisco Museum of Modern Art : Chronicle Books. Suggestions to the list are welcome.